When Rob Sainsbury joined the Kiama SES in 1985 he had to get a note from his mother because he was only 16. His extraordinary contribution of 35 years’, and counting, of service has recently been recognised through the awarding of Life Membership. Over the years he has attended emergencies of varying seriousness in the Kiama area, including car accidents, storm damage and cliff rescues. “With my other work as an ambulance officer and carpenter, I reckon I’ve been to every house in Kiama at some stage,” he says with a smile. Mr Sainsbury finds it hard to explain what has kept him involved all this time, attending two hours training a week and being available on call. “I guess it has become part of my life style. I enjoy helping the community out. These include bus crashes on Jamberoo Mountain Rd and at Kangaroo Valley, and the Thredbo landslide. 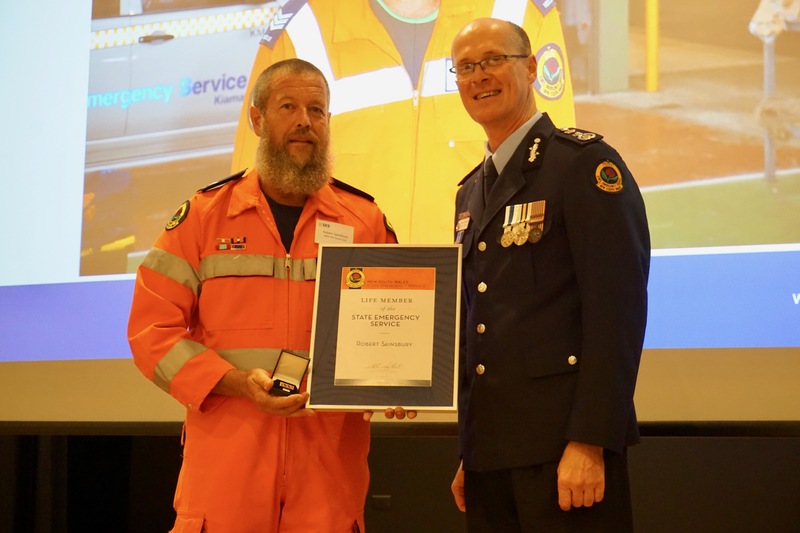 Other Kiama SES team members recognised on the night were David Leigh, with a 25 Year Long Service Award, and Louise Ashton and Garry Cass with 20 Year Long Service Awards. “These Awards recognise not only these volunteers’ commitment to the NSW SES, but also their dedication in looking after their communities. “Their accumulated wisdom and experience are irreplaceable,” said Gareth Ward MP at the ceremony.